The National Programme for the Control of Schistosomiasis and Soil-transmitted Helminthiasis has made great strides in addressing some of the public health issues affecting Cameroonians in all regions of the country. Together with our donors and partners, we continue to improve the health status of those affected by these malaises. 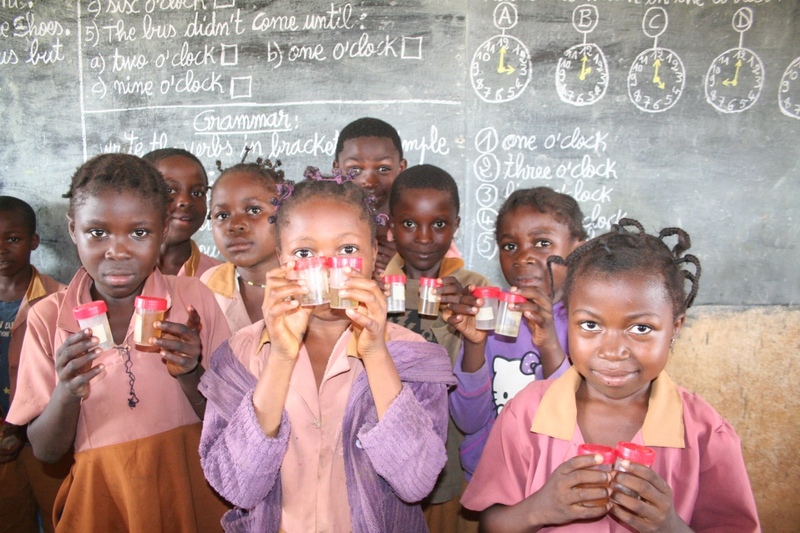 The first nation-wide deworming of school age children in all ten geographical regions of Cameroon took place in 2007 via help from national and international partners, notably USAID’s Neglected Tropical Diseases Control Program. Through effective partnerships, collaborative engagement and coordinated deployment of resources, this national deworming campaign successfully reached school age children annually since 2007. Results indicate a positive impact of annual deworming. 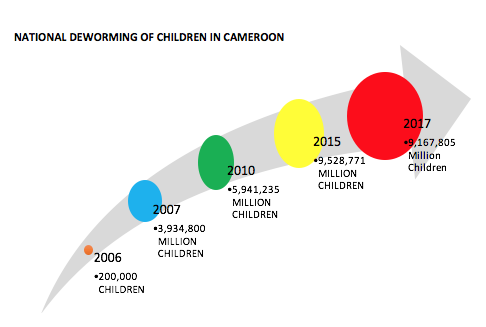 In 2007, Cameroon was the first country to benefit from drugs donated by Johnson & Johnson, through its partnership with Children Without Worms, the first program created which focused entirely on the treatment and prevention of STH worldwide. The support from Johnson & Johnson and other pharmaceutical companies such as Merck has been fundamental in the effective deworming of children annually. In 2015, we achieved an 87% therapeutic coverage for intestinal worms treatment with mebendazole, which exceeds the 75% target set by the World Health Organisation for all school-based deworming. In regards to schistosomiasis treatment for the same year, we had a 45% therapeutic coverage with praziquantel. In 2017, 9,167,805 million children were treated for intestinal worms in all regions of the country, while treatment for schistosomiasis was administered to 2,825,342 million children. Following numerous years of National Deworming Campaigns for school-age children (SAC) all over Cameroon, organised by the National Program for the Control of Schistosomiasis and STH, there was an urgent need to evaluate the impact of deworming on reducing the level of schistosomiasis and STH in SAC in selected regions. Through collaboration with partners - Sightsavers/GiveWell and USAID/RTI/Helen Keller International - the National Control Program organised parasitological surveys which were conducted in selected schools in 6 of the 10 regions, these being - Centre, East, Littoral, North West, South West and West Regions. The success of these surveys, completed between February and May 2018 by the research team at the Centre for Schistosomiasis and Parasitology, was due in part to the effortless commitment and contribution from all actors at various levels, at the Ministry of Public Health and Ministry of Basic Education at all levels. In 2010, the National Programme for the Control of Schistosomiasis and STH coordinated the nationwide mapping of schistosomiasis and soil-transmitted helminthiasis. This activity served to update previous distribution map created 29 years ago in 1987, thereby enabling the programme to determine where treatment should be extended, in the case of schistosomiasis. The map across illustrates results obtained from 3 of the 10 regions of Cameroon - Centre, East and West regions. These regions cover a total surface area of 191,847km^2, with a total population of 6,112,917 inhabitants and 63 health districts. In the Centre region, the prevalence of STH declined from 91% in 1987 to 28% in 2010. In the West region, the prevalence dropped from 78% in 1987 to 11% in 2010. In the East region, the decline was less, going from 83% in 1987 to 47% in 2010. Regarding schistosomiasis, results from the parasitological studies carried out indicated a moderate prevalence (between 10 and 49%) in 23 of the 245 schools investigated, while 4 schools registered high endemicity (prevalence at more than 50%). 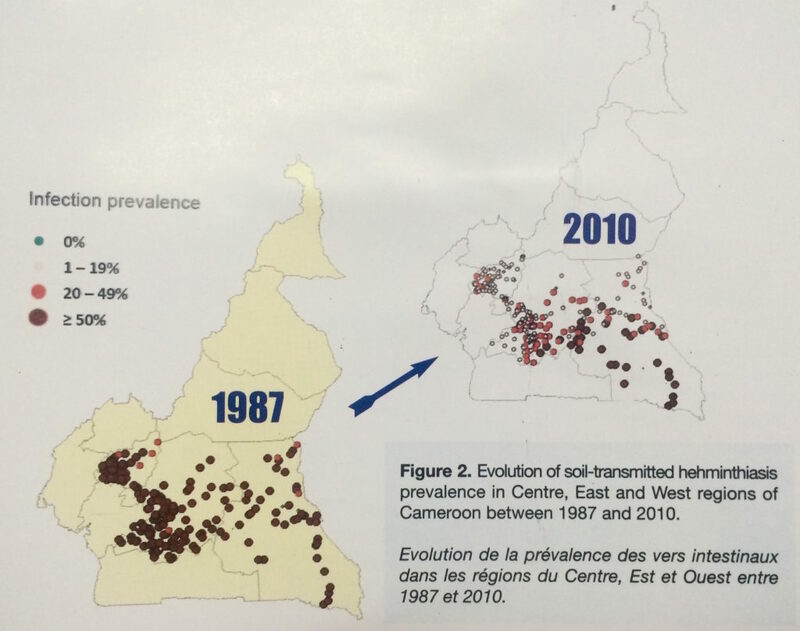 Comparing results for the former and latter mappings, it is clearly visible that annual deworming campaigns have positive impacts and this illustrates the progressive success of the control of schistosomiasis and intestinal helminthiasis in Cameroon. 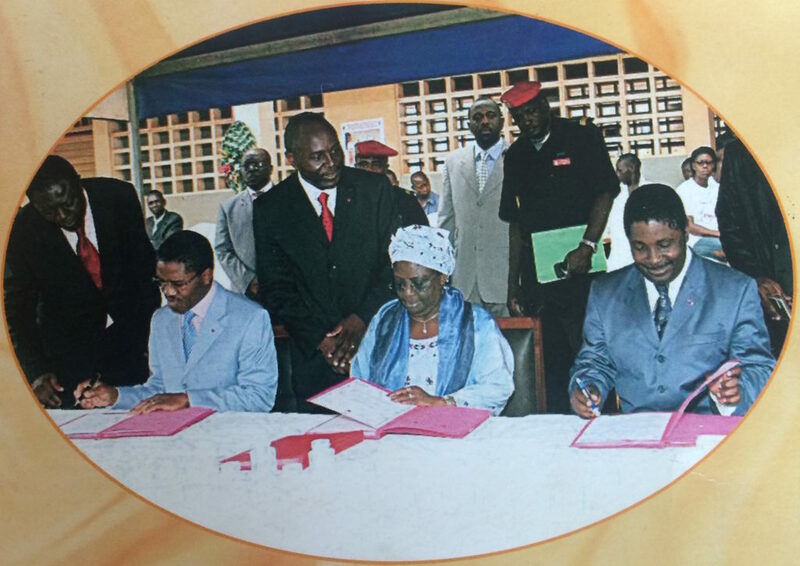 At the apex of an extensive process of discussions and negotiations, the Ministry of Public Health, the Ministry of Basic Education and the Union of United Councils and Cities of Cameroon signed a tripartite agreement in 2009, to boost the control of schistosomiasis and intestinal helminthiasis in Cameroon. This is an essential factor in local ownership and sustainability. Taking into account that some of the school age children targeted are in secondary schools, the Ministry of Secondary Education subsequently signed the partnership in 2012. This permits the programme to reach its target of 75% therapeutic coverage for treatment of all school age children (5-14 years).